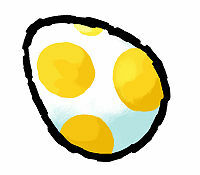 A Yellow Egg is a Yoshi Egg first found in Super Mario World, where it merely hatches into a Baby Yellow Yoshi. Starting with Super Mario World 2: Yoshi's Island, Yellow Eggs play a much different role: when a Yellow Egg hits an enemy, one coin prevails from the said egg. Yellow Eggs can be acquired if Yoshi throws a green Yoshi Egg that recoils once from the wall. Yellow Eggs can also be obtained from yellow Egg Blocks, though unlike the green Egg Block, Yoshi only gets one egg. This page was last edited on February 12, 2018, at 23:01.